So you’ve had a no-good, terrible, awful day. The kind of day that only cookies and milk can fix. But holding the cookie in the milk while it’s soaking? Ugh, who has time? Thankfully, someone heard our disgusted sighs and invented the most perfect answer to the lazy cookie dunker: The Dunkin’ Buddy (patent pending). 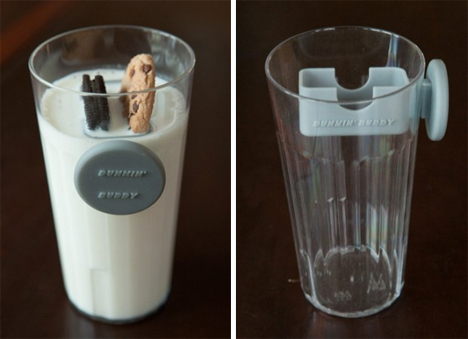 This invention is a “hands-free cookie dunking device” that is “designed not only to save cookies from breaking and getting lost in your cup, but makes multitasking easier.” The inventors suggest that with your hands free from holding your cookies in a glass of milk, you’ll have more time for other hobbies like video games, homework, and working on your computer. Basically, The Dunkin’ Buddy is a two-piece magnetic tray. 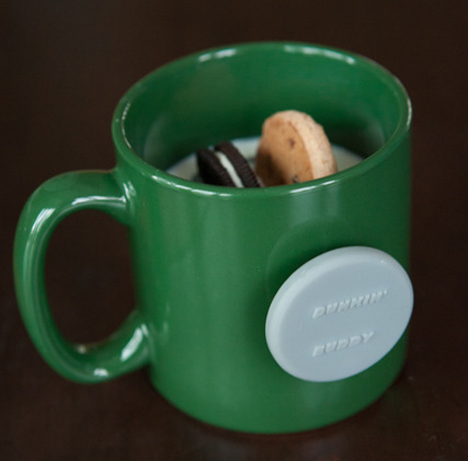 The dunking chamber sits inside of your drinking cup and the magnet that holds it there sits on the outside. In theory, you fill the entire drinking vessel with milk and lower the tray into the milk via the exterior magnetic handle. You can then control how much milk comes into contact with your cookies, and the tray is even big enough to dunk two cookies at a time. We had to do a lot of digging before we could be sure the Dunkin’ Buddy wasn’t an April Fools’ Day prank. Really, if holding your cookies in a glass of milk for a few seconds (up to 30 or more, according to the inventors, depending on cookie type) takes way too much time out of your day, you might actually be too busy to eat cookies and milk right now. Just put down the XBox controller and take a two-handed cookie break, muchacho. But there are people who see this invention as a useful accessory to their apparently very important cookie eating. Lots of them, in fact. 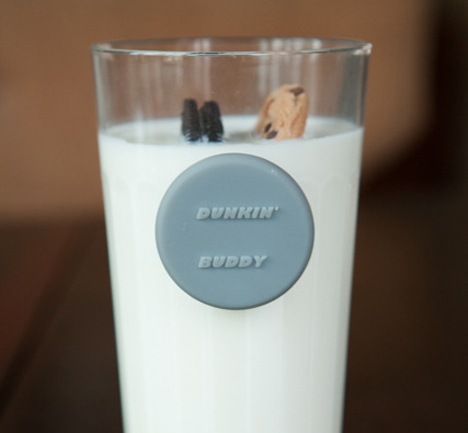 Although the Kickstarter campaign to fund the manufacturing of the Dunkin’ Buddy was unsuccessful, the product has since found a manufacturer and it’s being produced for retail sale. The inventors, Jason Wells and Kiana Machnicz, say that the final product will have a different design than the publicized prototype – but they aren’t revealing it until the product is ready for retail.